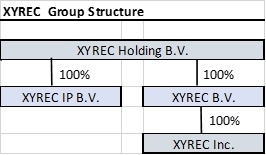 The legal structure of the XYREC Group, as seen in the graph below, shows XYREC Holding B.V. and its wholly owned subsidiaries. All entities are Dutch, except for XYREC Inc., which is a Delaware company. Most of our customers and partners will deal with XYREC B.V., which is responsible for the development and production of our robots and for customer support. Customers in the United States will be serviced by XYREC Inc.
XYREC IP B.V. has been established to safeguard all intellectual property and to ensure the continued availability of IP for (further) development of products and services in the interest of our customers. XYREC Holding B.V. is responsible for the funding requirements of its subsidiaries and provides typical head office services. Corporate governance for the Dutch entities is determined by Dutch Corporate Law. The Board members of XYREC (CEO and CFO) are jointly authorized to represent the Dutch XYREC Group companies. In a shareholder’s agreement, specific decisions have been identified that require approval by the General Meeting of shareholders. In the Netherlands, all entities are by obliged by law to register at the Netherlands’ Chamber of Commerce. Only civil law notaries are allowed to inform the Chamber of Commerce about incorporation of entities, the issuing and change in ownership of shares and changes of the company name, leaving the CCI number unchanged. Corporate governance for XYREC Inc. is determined by Delaware General Corporation Law. Board members are Peter Boeijink (CEO) and Pieter van Mal (CFO), jointly authorized to represent XYREC Inc. Decisions specified in the shareholders agreement are subject to approval by the General Meeting of shareholders of XYREC Holding B.V.